I wanted one of these! Great vintage turquoise and it all comes apart for cleaning and so you can admire the blown-glass insulated vacuum insides. Thank you, thrift store. Comes apart for cleaning? Excellent. I like your carafe! I notice that you have pomegranates in the picture. Would you mind sharing what you do with them? Do you juice them or eat them raw? Is that a thermos? If it were, it's the loveliest thermos I've ever seen! 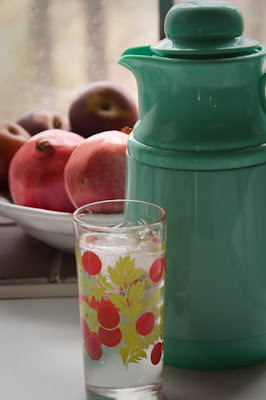 If it's not, it's one of the loveliest jugs I've ever seen. You have the best thrift stores in your area! What a terrific find. I adore Turquoise:) Very nice. Denise, I sometimes dry my cotton sweaters if I don't mind a little shrinkage. Otherwise, and always for wool, I lay flat to dry and then press lightly or steam with the iron if they need it afterwards. Not looking the same is just the price you pay for not dry-cleaning, in my experience. I don't mind paying it for the cleanliness and thriftiness of skipping the dry cleaner!